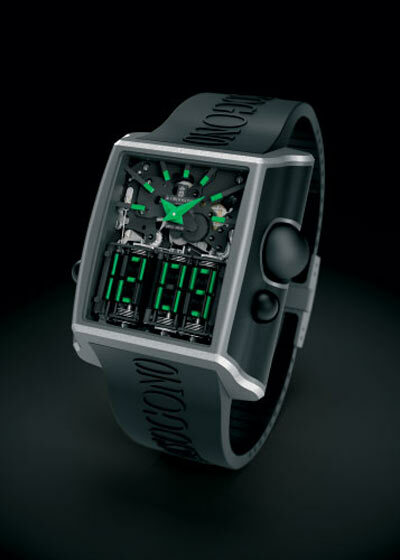 Check out this amazing watch, the The Di Grisogono Meccanica DG Digital / Analog Watch. This stlish looking timepiece may look like a combination digital / analog watch, but it is actually all analog. It is made from a total of 651 pieces and has no digital parts or LEDs. The mechanically operated digital display of the second timezone shows tens of hours, single hours, tens of minutes and single minutes, all displayed by mobile microsegments driven by an assemblage of 23 cams connected to a set of gears and a triggering and synchronization system. The time information is displayed by an array of 23 horizontally and vertically positioned microsegments. Vertical segments are 9 mm high and weigh at most 25 milligrams while the horizontal segments measure 2.90 mm in length and weigh only 10 milligrams. The segments have four faces: two opposing visible faces fitted with colored strips and two opposing unmarked faces. Time changes are effected by 90° rotations of the required segment or segments. Involving one to twelve segments, time changes are lightning fast. They will only make 177 of these amazing watches, and you can bet they are going to cost a bit.